Corporate event management is a serious business, and the corporate event industry in the UK is huge. From conferences to educational seminars and product launches, event managers up and down the country are always on the lookout for ways to make attendees remember their event more vividly than the last. Welcome to the kookie world of corporate cakes. The perfect way to mark an occasion, a bespoke corporate cake is bound to make any event more memorable. After all who doesn’t love a scrumptious piece of cake? A wow-factor cake creation is the perfect way to get a corporate party started. 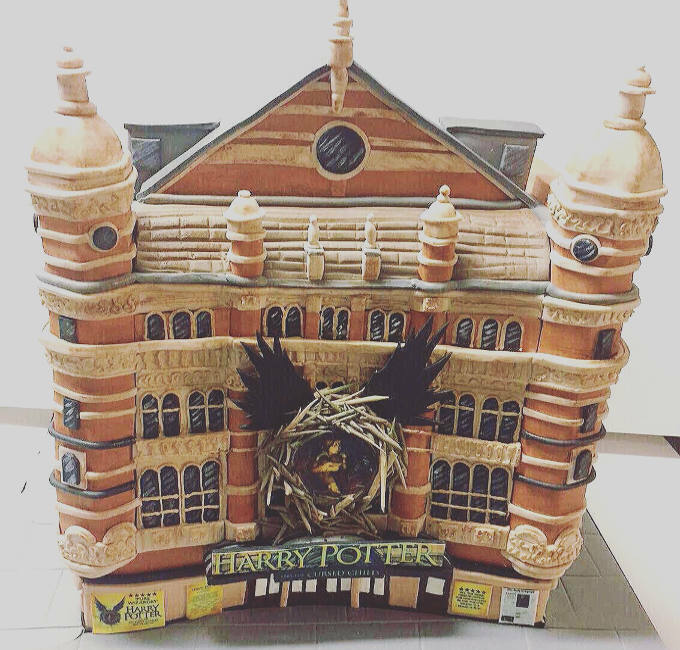 We bet the celebrations for the opening of the Cursed Child Harry Potter theatre show were wowser (shhh we made the cake). It’s true, corporate cakes are taking the event world by storm. Elaborate cake creations adorned with edible company logos are becoming quite the thing in corporate event circles. Clients attending product launches and corporate events get the message and brand awareness all the more with a tasty piece of cake when they break for tea, so it makes perfect cake sense! Whatever the corporate occasion, a slice of cake and a cup of tea is always going to go down well. Some clever managers are cheering up their team with freshly baked cupcakes, getting them delivered directly to the office just in time for that all-important meeting. Cakes with edible company logos are perfect for business launches, company milestone celebrations, and go down a treat at the company Christmas party, not to mention as a thank you or a treat for special achievements. 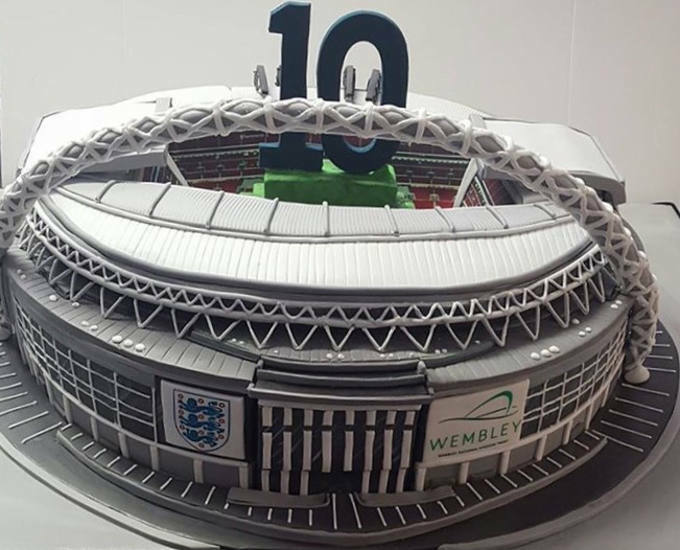 Our Wembley Stadium cake was commissioned to celebrate the 10th Anniversary of Wembley Stadium being built. An impressive cake at a corporate event puts a smile on everyone’s face. Sharing cake around cuts through the organisational hierarchy like a knife through butter. Cake brings people together. A slice of cake served in break-out meetings is a great ice-breaker, and makes perfect fuel for fostering fantastic ideas and collaborations. The hardest thing with some of these awesome corporate cake creations is to imagine that there’s actually an edible cake inside. 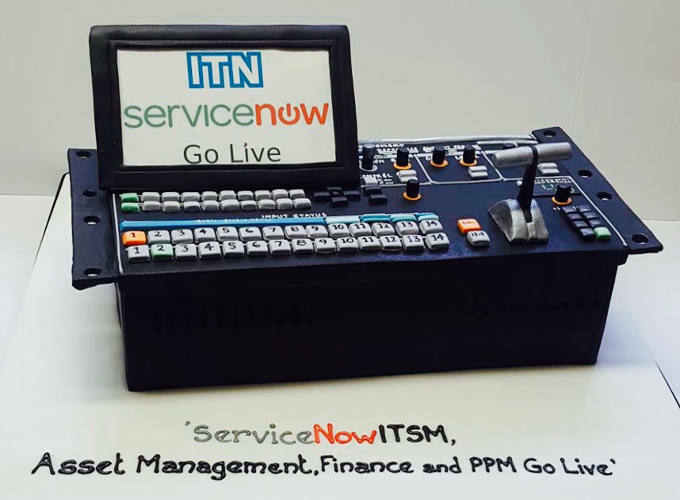 We loved making this Asset Management, Finance and PPM Go Live cake, ordered to celebrate the launch of a new news platform. Can you believe it’s actually deliciously edible!